The sudden occurrence in February 1987 of the explosion of "SN 1987A" supernova attracted the global attention of the scientific community generating a quest for detailed astronomical observations of the sky in the southern hemisphere, the only point from where it was noticeable the unusual phenomenon. In that context, a cooperation was initiated by the French space agency (CNES) in conjunction with the Italian National Center for Research (CNR) with the australian government in order to develop new facilities to carry out trans-australian flights. 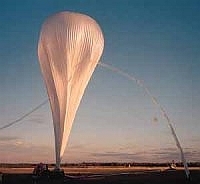 The goal was to organize a field campaign to launch stratospheric balloons carrying astronomical instruments. The chosen place to mount the launch operation was the airport of Charleville, a city located in the southwest part of Queensland territory, while a down range station was set up in the outback country of the Northern Territory, 1300 km West of Charleville. During the first campaign two launches were carried out between October and November 1988. Although the flights were entirely controlled from the prime tracking station, they were continously followed in the down-range station thanks to a direct telephone link, achieved thru the australian Digital Data Network. This connection, which allowed the transmission of telemetry data at a reduced rate of 10 kbps, performed with a remarkable efficiency. After that succesful campaign, there was another attempt to make other launches in 1992 but due to bad weather that effort was initially postponed and eventually canceled. After that time the site was not used again for launching stratospheric balloons.